18 Inch Stamped Steel Baseboard Register - White Discounts Apply ! Triangular baseboard diffusers are a snap to replace and you will love how much of a difference a new one can make. These metal heat registers are made of steel for maximum durability. The triangular baseboard diffusers are have a powder coat finish to prevent rusting and to provide a tough white finish. Metal heat registers will have a damper which will allow you to control the air flow. The sunburst design found on these triangular baseboard diffusers provides three way deflection for outstanding air distribution. Another great feature these metal heat registers have to offer is a removable faceplate. 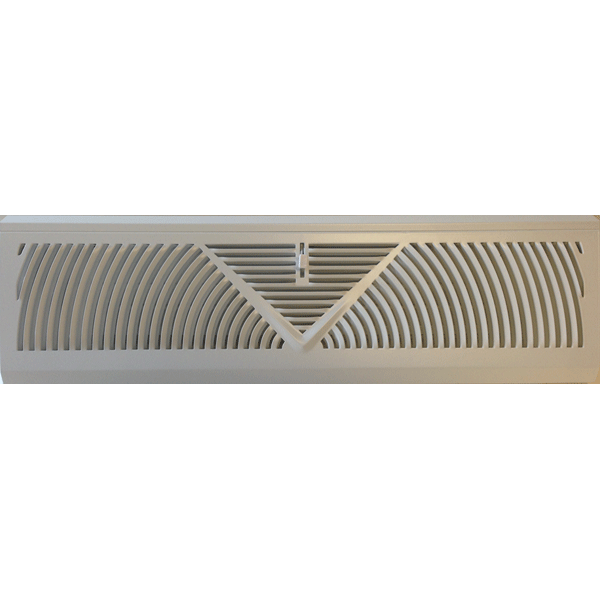 The removable faceplate of the triangular baseboard diffuser makes installation a snap and allows for easy cleaning. Find baseboard registers in more styles and finishes. Try these metal heat registers and delight in how easy it is to install and clean them.